Saint Patrick’s Day is just around the corner! With a new holiday comes new books to enjoy reading with the kids. These thirty-three children’s books are wonderful to help celebrate all things leprechaun, green, and gold! Jamie O’Rourke and the Big Potato: An Irish Folktale : Jamie isn’t the hardest worker of Ireland, and rarely helps his wife on the farm. But after an encounter with a leprechaun, he finds himself growing the biggest potato in the world! The Luckiest Leprechaun – A Tailwagging Tail of Friendship: MacKenzie O’Shamrock is a leprechaun convinced that all human beings are after his gold. But everything changes for Mac the day a dog called Lucky crashes through his roof. The Leprechaun Trap: A Family Tradition For Saint Patrick’s Day: This children’s book tells the story of a naughty Leprechaun that comes to visit an Irish-American family every St. Patricks’ Day. He causes a lot of damage and the kids try to trap in to get his gold. The Leprechaun Who Lost His Rainbow: When Roy G. Biv, a leprechaun, appears and asks Colleen’s help in saving the St. Patrick’s Day parade, she offers items of different colors to rebuild his lost rainbow, but she is reluctant to give him one thing. Patrick’s Day Countdown: A fun countdown alongside forest friends in a shimmery board book! Filled with bright colors and fun rhyming words, this one is sure to be a treat! Leprechaun on the Loose: A leprechaun is on the loose in the classroom and Sidney is the only one who sees him! Can Sidney catch that leprechaun before he ruins the St. Patrick’s day parade? Discovery In The Woods: A St. Patrick’s Day Surprise: In book one of this series, a St. Patrick’s Day surprise is discovered in the woods. Kids 8 and up will have a fun time diving into this story! Leprechauns Don’t Play Basketball: In this book, geared towards kids 7 and up, the readers will enjoy a fun story about a basketball coach who is suspected of being a leprechaun! The Leprechaun’s Gold: In this classic Irish legend, two harpists set off for a contest to name the finest harpist in all of Ireland. That’s What Leprechauns Do: This amazing picture book brings to life the fun tale of mischief and leprechauns! You’ll read not just about them burying pots of gold, but also about their mischief in-between! Shamrocks, Harps, and Shillelaghs: The Story of the St. Patrick’s Day Symbols: this fun and educational book will help you learn about all the symbols of St. Patrick’s Day and who St. Patrick was! Filled with colorful stories, legends, and historical facts behind the holiday, the spirit of this ancient Irish holiday is unfolded. Leprechaun in Late Winter: Jack and Annie meet an Irish girl and go on a magical adventure that changes her life! She grows up to be someone who helps bring back the Irish legends. A story that you’re sure to enjoy! Laura and the Leprechauns: Laura believes in leprechauns, but her friends convince her that they aren’t real. She doesn’t give up that easily though and decides to write to the wee folk to find out herself. How to Catch a Leprechaun: A fun and quirky book that everyone will enjoy! This is a great one to add to your holiday collection! The Night Before St. Patrick’s Day: An Irish twist on a Christmas classic! The night before St. Patrick’s Day, two kiddos set traps to catch a leprechaun! Did they catch him? You’ll have to read the story to find out! There Was an Old Lady Who Swallowed a Clover! : She’s back and swallowing a clover this time! A fun St. Patrick’s Day twist on a fun and popular kids story! Happy St. Patrick’s Day, Curious George: Curious George is having a lucky day! He loves a celebration and St. Patrick’s Day means lots of fun and festivities! But can he make it to the parade without causing any trouble? Fiona’s Luck: The greedy Leprechaun King has locked away all the luck in Ireland and the whole country has fallen in to despair. Through clever charades, Fiona outwits the Leprechaun King and restores luck to the land. 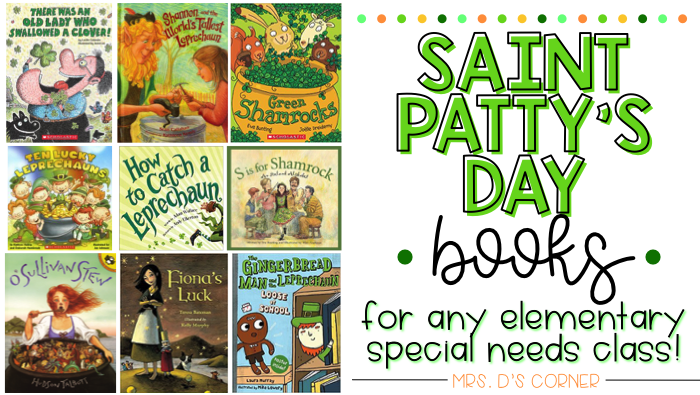 It’s St. Patrick’s Day: A fun reader full of rhymes that introduces children to the St. Patrick’s Day holiday! O’ Sullivan Stew: Someone has stolen the witch of Crookhaven’s horse, and there will be no peace in the village until it is returned. So bold, brassy Kate O’Sullivan takes matters into her own hands. St. Patrick’s Day in the Morning: A sweet story of a little boy finding his independence and wants to prove that he’s not too young to march in the bit St. Patrick’s Day parade! Green Shamrocks: Rabbit has been growing shamrocks in his pretty yellow pot, but they go missing! Will he find them in time for the parade? Irish Pirates & St. Patrick: a fun combination of Pirates and St. Patrick’s Day, read the story behind the legendary history of St. Patrick – your average prank-pulling kid who’s abducted by Irish Pirates. A Fine St. Patrick’s Day: Two towns, Tralee and Tralah, compete in an annual St. Patrick’s Day decorating contest which Tralah boastfully always wins, but when their hearts are put to the test by a little man with pointed ears, something different happens that turns the contest upside down! Ten Lucky Leprechauns: Count from one to ten as one little leprechaun looking for treasure magically becomes ten silly leprechaun friends at the end of the rainbow! Clever Tom and the Leprechaun: An Old Irish Story – Clever Tom things he’s smarter than a leprechaun and can make off with his gold. But the leprechaun has a few tricks up his sleeve. This is a fun folktale that children will have a blast reading! S is for Shamrock – A Ireland Alphabet: S is for Shamrock: An Ireland Alphabet gives readers a guided A-Z tour of this small island country whose influence extends far beyond its sea borders. Hooray for Saint Patrick’s Day: It’s Saint Patrick’s Day, and time to join in the celebration. This book is a great way for young readers to learn about and enjoy the holiday. The Luckiest Saint Patrick’s Day Ever: Share in this leprechaun family’s charming St. Patrick’s Day celebration, complete with a fun parade and an Irish feast! The Story of the Leprechaun: In a faraway village lives a talented little shoemaker—who also happens to be a leprechaun. But one day a greedy man named Tim spies the leprechaun’s pot of gold and tries to steal it! How can the little leprechaun outsmart Tim and make sure his pot of gold will be safe forever? Shannon and the World’s Tallest Leprechaun: Shannon is a stepdancer with a broken shoe. How can she ever win the Saint Patrick’s Day stepdancing contest? Enter Liam, the world’s tallest leprechaun. A leprechaun grants wishes, right? Harp O’ Gold: Tom, a poor wandering Irish minstrel who dreams of riches and fame, trades his beloved but worn harp for one made of gold, but when he becomes famous he finds that something is missing. Are there any children’s books I missed that should be on this list? Leave a comment and let me know!